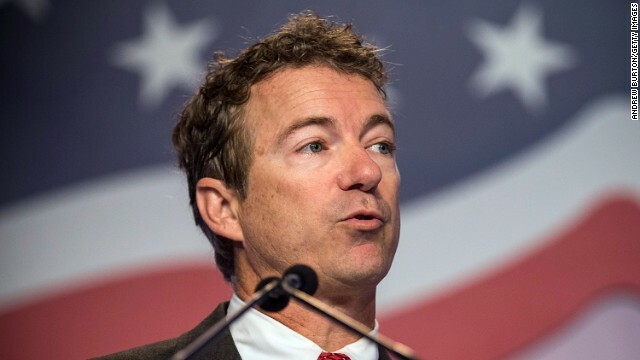 Washington (CNN) - Sen. Rand Paul is pushing back against an increasing number of accusations of plagiarism in his speeches, including a new claim that the Kentucky Republican lifted more than a thousand words from a Heritage Foundation study for his 2013 book. "I take it as an insult, and I will not lie down and say people can call me dishonest, misleading or misrepresenting - I have never intentionally done so and like I say, 'If dueling were legal in Kentucky, if they keep it up, you know it'd be a duel challenge,' " Paul said Sunday on ABC's "This Week." Numerous reports last week spotlighted instances where Paul, a favorite of many tea party supporters and grassroots conservative activists, and a likely 2016 GOP presidential contender, seemed to have lifted entire lines from other sources, including Wikipedia, in his speeches. "I didn't get into the secondary sources and say I quoted Einstein as according to an AP story or as according to Wikipedia," said Paul. "I think the spoken word shouldn't be held to the same sort of standard that you have if you're giving a scientific paper. I've written scientific papers, I know how to footnote things, but we've never footnoted speeches, and if that's the standard I'm going to be held to, yes, we will change and we will footnote things." Paul added that it's difficult to attribute sources in his speeches since he said "98 percent" of his addresses were extemporaneous, but said he'll adjust if that's what necessary. "If it's required, I'll do it, but I think I'm being unfairly targeted by a bunch of hacks and haters, and I'm just not going to put up with people casting aspersions on my character," said Paul. Paul's comments came as BuzzFeed reported over the weekend that Paul copied 1,318 words from a 2003 case study from the Heritage Foundation for his 2013 book "Government Bullies." The report points out that the book's footnotes included a link to the Heritage report, but that no attempt was made to indicate that the words in Paul's text had been taken directly from Heritage. A senior adviser to the Senator defended Paul, saying he makes it clear in the book's "notes and sources" that he didn't individually research each case. Doug Stafford, who co-wrote the book with Paul, told CNN that "sources used in the book are cited in the endnotes. The longer passage should have been indented and quoted to note a direct quotation." "There were 150 endnotes and cites including The Heritage Foundation and Cato Institute. This is a witch hunt and grasping at straws," added Stafford, in separate comments to BuzzFeed. A spokesman for Heritage told CNN that they're happy to have their work cited by Paul, and that the straight lifting of the paragraphs didn't bother them. "Can you cite comments from the liberals here cheering such activities?" – Nuttier than his 3 time loser father. – The Aqua Buddha Boy has no class . He is upset about drone air strikes but says using land mines is ok.
– He just proved what a bag of hot air he is. – Drone all you southern confederate traitors. – They should use a drone on Paul so the American people don't have to listen to his gop idiotic big mouth ,forget about ever being president you moron, just like your father ,gop goof !!!! – I live in Kentucky and have to be embarrased by Rand Paul's representation. Need I mention that I also have Mitch McConnell to deal with? Please excuse us hillbillies. – Rand Paul is a grandstanding idiot. Shall I go on? This is a very small example. "However, the hate spewing from the left at Rand Paul is so funny because this guy actually has positions that liberals used to agree with B.O. (Before Obama)." I don't hate on Rand Paul, tom. I simply don't consider him a viable candidate for President of the United States. Instead of faulting those of us who will never support Rand Paul, try offering us a candidate we can vote for.